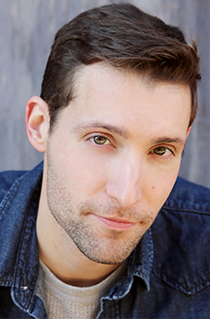 PlayMakers: Company member in second year of UNC’s Professional Actor Training Program. Jump, She Loves Me, Tartuffe, Dot, Sweeney Todd; PlayMakers Mobile Macbeth. Regional: Big Fish, Significant Other, Lombardi, The Mystery of Edwin Drood, A Few Good Men, Crimes of the Heart, The 25th Annual Putnam County Spelling Bee, Avenue Q (Theatre Raleigh); Grease (North Carolina Theatre), The Full Monty, Annie Get Your Gun (Theatre Workshop of Nantucket); The Glass Menagerie (Bartlett Theatre); Rudolph the Red-Nosed Reindeer (Broadway Series South). Film/TV: Max Steel, Well Wishes, Adrenaline, Turn: Washington Spies, The Originals, Under the Dome, Revolution. Education: BA in Theatre (Performance Concentration) from the University of North Carolina at Wilmington.